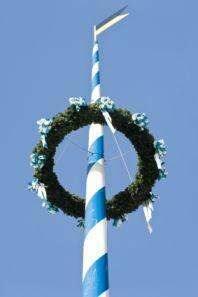 Late springtime brings maypole dancing to many regions of the world, including Europe and the United States. This traditional dance style continues to thrive today. Maypole dancing originated in Western Europe during ancient times, and is considered a type of traditional folk dance. You will most commonly see or hear about it in places like England, Portugal, Germany and Sweden, though the trend has spread to other parts of the world as well. The maypole itself is a very tall pole decorated with ribbons, garlands, flowers, stripes and local emblems signifying the uniqueness of that specific maypole. Dancers perform a traditional circle dance around the pole, and in some variations, each dancer holds a colorful ribbon attached to a small pole until all of the ribbons have been woven through each other and attached to the pole for final décor. No one knows for sure how far back maypole dancing dates. However, there are a few theories. The first is that it originated as a pagan fertility ritual, but there is little to no evidence to support this idea. More "modern" maypole dancing may have come from the 18th century artistic awakening in Italy and France. The tradition of the ribbons plaited to the pole by dancers came over to London around this time and became a popular performance piece. Teachers then caught on to the trend and used dancing around a maypole in their classrooms, which continues to occur today. No matter the origins of the actual design of the maypole dance, most maypole dancing takes place to celebrate May Day, which celebrates Europe's labor movement. It is commemorated on May 1st in most European countries, but takes place in midsummer in Sweden, which is virtually the only exception. As mentioned above, school children both in the US and in Europe often learn Maypole dancing as part of their curriculum at some point during the spring months. Traditionally, maypole dancers are young girls, though anyone can dance for fun. However, in traditional celebrations around the world, female children are usually the primary dancers. Some gatherings include children as young as three or four years old, however you'll usually see elementary school aged children twirling the ribbons around the pole. You can adjust a maypole to accommodate many different group sizes, even as many as 25 dancers. However, the typical number is usually between 12-16 dancers. However many you choose, try to end up with an even number of dancers, as this makes the ribbon intricacies simpler and ensures everyone has a dancing partner. Just as the maypole itself is rooted in tradition, much of the costuming is the same way. There is a legend that modern maypole dance costuming in one region was simply put together from nightgowns purchased at a local clearance sale and then embellished with ribbons, satin and plastic flowers. Traditionally, the dance costumes should fit a European vintage outdoor theme - flowing dresses, hair ribbons, a distinctly Renaissance feel. Girls participating in a May Day celebration may choose their favorite color for their dress, flowers and ribbons, as the dancing looks best when everyone is wearing a different color. If you're a teacher or anyone else looking to throw your own May Day celebration and you'd like to include maypole dancing, it is fairly simple to get your own pole up and running, You will need a wooden pole with some sort of knob fastened to the top. Try to make your pole at least 7 or 8 feet high, and anchor it firmly into the ground so the pull of the dancers' ribbons doesn't make it topple over. Tie the ribbons to the top of the pole securely, and hand the end of each ribbon to a child. Children can then braid the ribbons around the pole as they are dancing, and then retrace their steps to unwind it again if so desired. Maypole dancing is an enjoyable activity the whole family can get involved in. From constructing your own pole to visiting a local celebration that includes this dance style, consider making May Day a tradition in your home this spring.